My son did this cave art using paint, fingers and a popsicle stick inspired by Croods. Watch the clip of this episode, as Eep and Thunk compete for a spot in the "in" crowd or inside the predator defense circle but first they'll have to prove they have the guts to hang with a pair of Ahhh! Valley's biggest predators: the Ramu's. If you are in Canada or USA and would like to win a prize pack before December 29th please enter it through the rafflecopter below. Please leave comments and follow my social media networks to be eligible to win. 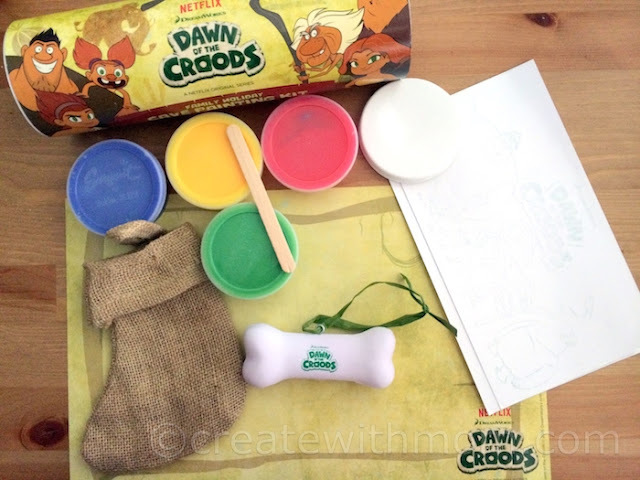 Hanging your very own "Dawn of the Croods" ornament in the shape of a bone and a burlap stocking. 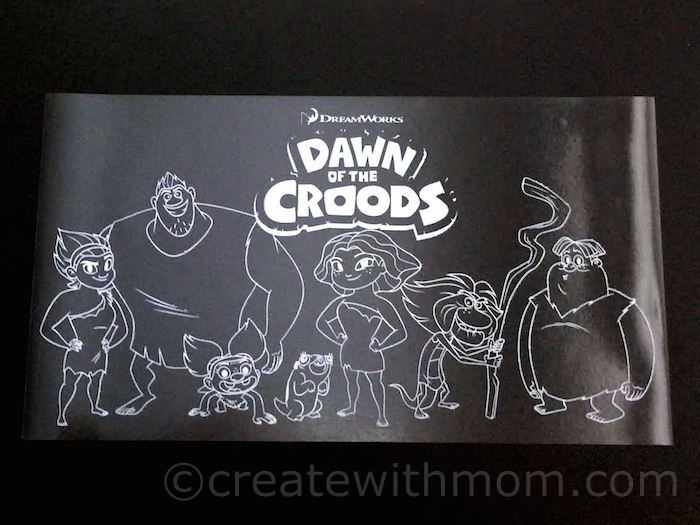 Croods Family Vehicle decal to customize how your family lives up to the Croods. 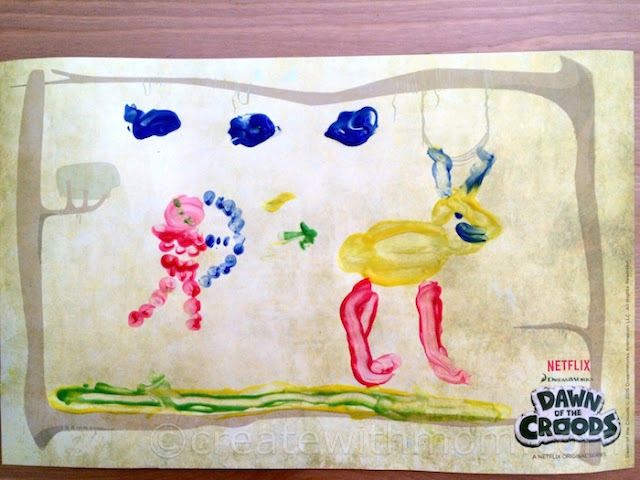 1 set of 4 washable finger paint and rolled parchment to create your very own wrapping paper like the Croods did back in the day. We live in BC. We do have Netflix and my kids love the Croods. I am in Canada and yes, we have Netflix. I want to win this for my daughter. I live in NB and we do have "Netflakes" as my little guys call it. They would definitely like this prize pack. I'm in Canada and I would love Netflix because I currently don't have it and I would love to watch shows that are specially produced for Netflix. I live in Illinois. We have netflix, my son watched the Croods on it for the first time and he loved it, i would love to give this to him. I live in BC. We have Netflix. The Croods was one of our favourite family movies. I would like to win as it would be fun for my little grandson. I am in Canada. We have Netflix. I want this for my niece. She loves The Croods. I live in Charleston, South Carolina. Yes, we have NetFlix. I want to win for nephews. I live in Ontario. Yes I have Netflix. I live in London, Ontario. We have Netflix and we just love Croods that is why I want to win. I live in Ottawa, Canada. I don't have Netflix but we are looking into getting it..TV is soo expensive! I live in BC, Canada. We love Netflix, great for movies and for the kids to watch shows! I love catching up on series I missed on tv too! I live in Ontario. I used to have Netflix and I'd like to win because I miss it! I live in Newfoundland,Canada I do not have Netflix,i will love to try it i heard they have awesome programming ! I live in Toronto. I do have Netflix and love it!